National Democratic Congress; A House Engulfed In Confusion And Chaos! The opposition National Democratic Congress has lately been in the news for all the wrong reasons owing to calculated efforts by some key party functionaries and gurus to ensure that former President John Dramani Mahama is made the party’s flag bearer willy-nilly. This schemed agenda began with the party’s organized unity walks across the various regions which were made to headline only the former president as the main speaker at the organized walks. It did not take a genius to come to the realization that those walks were tailored to promote the candidature of the former president. Attempts by some party supporters to have this anomaly reversed proved futile. Another incident that gave meat to the determined decision to project former President John Dramani Mahama against the other contestants was the use of Mahama’s song at the party’s National Executives’ elections held at the Trade Fair Center, Accra. Try as the others might to have that anomalous move changed, the Mahama team would not budge. No sooner had the party brought the curtains down on its national executives’ elections than another incident reared its ugly head; the race for the party’s presidential candidate in preparation towards elections 2020 took a new direction. Actions and inactions of the elected National Executives have depicted that they do not only support Mahama behind the scenes but display this publicly and these officials who should act as referees have ganged up and are supporting Mahama to lead the party into the next elections. The Ofosu-Ampofo/Asiedu Nketia-led National Executives Committee intensified their machinations to propel Mahama to the top to the detriment of the other aspiring candidates. 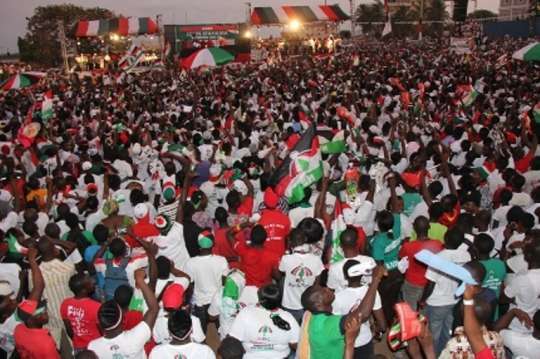 The party announced, much to the consternation of many political pundits and actors alike, a staggering amount of GHC420, 000 as the filing fee every aspirant is expected to pay. This announcement has brought in its wake series of agitations from some core party members who believe the party is being sold to the highest bidder. Condemnations from all the aspiring candidates apart from John Mahama filled the airwaves. The aspirants hold the view that the humongous filing fee being demanded from them is not only a disincentive to them but also something that goes against the grain of the party’s belief system. According to Hon. Alban Kingston Sumana Bagbin, the GHC420, 000 filing fee is worlds apart from the party’s social democratic orientations. It is a widely held view that this astronomically huge jump in the filing fee from GHC50, 000 some three years ago to GHC420, 000 is in a sharp conflict with the party’s social democratic ideologies and principles which seeks to consider ostentatious lifestyles of party members and those at the top not welcoming. While the tempestuous furor rages on, eight of the aspiring candidates deemed it fitting enough to petition the party’s Council of Elders which includes former President Jerry John Rawlings to register their intense opposition to these developments. Former President Rawlings, on his part, has described the development as worrying and that they defeat the core values and principles upon which the NDC was formed. The former president and founder of the National Democratic Congress has also intimated that only those who could steal from the state while serving in various capacities when they were in office could pay this staggering fee of GHC420, 000. In the midst of all these, Ghanaian woke up to witness a drama of a sort which was staged to give former President Mahama’s candidature a boost. When the other aspirants have been complaining bitterly about the exorbitant amount of money being charged as filing fee, some MPs, in a very melodramatic fashion, came out to say that they have contributed money towards Mahama’s filing fee. There was also this razzle-dazzle act of ordinary party members having contributed to the filing fee of the former president, this, some say, is enzymic of the fact that the former president enjoys the support of the grassroots of the party and that Ghanaians support him. The truth of the matter is that these bussed contributors contributed nothing, it was just staged to create a certain effect. The other aspirants were being told, virtually, that Mahama is the man with swag and so, all the other aspirants should step aside honourably. The NDC is at the crossroads, spinning out of control resulting in internal wrangling engulfing the party birthed and nurtured by Jerry John Rawlings. Mahama has the party at his beck and call, he does whatever he pleases with the party because he is the cash king now. He controls the current National Executives because he has the cash to bankroll the party in the coming elections. His Excellency Jerry John Rawlings is enraged at the current happenings in the party he founded as is being torn apart due to one man’s overzealous ambition to control every facet of it. He feels the party he formed out of a revolution is on the brink of collapse simply because a certain John Dramani Mahama believes he is God’s gift to the party in particular, and Ghana in general and so, must be given another opportunity at the Presidency of Ghana. Alban Bagbin and his partners in crime are in a limbo. They are in a dilemma. They can neither go forward nor retrace their steps. Their fates hang in a balance. It appears Mahama and his NEC has decided on their fates. RAS MUBARAK's DONATION TO JM HAS MADE NONSENSE OF HIS "ECONOMY IS HARD" MANTRA. Somehow, these NDC MPs have managed not only to commercialize comedy but also patented it. Ras Mubarak, the Kumbugu constituency Member of Parliament, not long ago, rode a bicycle to Parliament to send the message out there that hardships of unprecedented levels have engulfed the masses, including those in the upper class, MPs included. The noise that ensued as a result of that melodramatic act cannot easily be forgotten. The furore arising out of his drama still lingers in the minds of many a political pundits. Is it not ironic that someone who claims to have been impoverished by the so-called bad economy has gleefully contributed to John Mahama's filing fee fundraising? These hypocritically pious dudes in the NDC can no longer deceive the general populace when their lives of debauchery depict them as people with money to burn. It stands to reason, that drama staged by Ras Mubarak was just for the cameras and to create a certain impression that Akufo-Addo's economy is not working, when the reality is that Ghana's economy under His Excellency Nana Addo Dankwa Akufo-Addo is on a very sound footing. Let no NDC executive or party faithful say the economy is bad since they have displayed to all and sundry that indeed their pockets are filled up with cash. Many a Ghanaian is beginning to accept the fact that the opposition National Democratic Congress is home to a mountain of chaos and it will take a divine intervention to normalize the ills which have submerged it.